I took a while to prepare myself for this. It took a basket full of encouraging words from patrons, reading enthusiasts and academicians for me to finally put my compilation out there in the market. 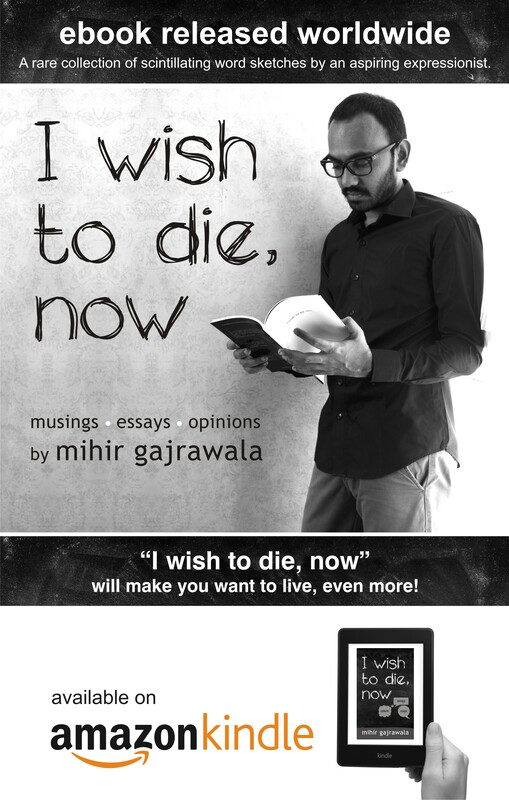 Yes the kindle edition of “I wish to die, now” is up and available across all major amazon online stores across the globe. All you need is a kindle or a kindle reader on your device. I genuinely look forward to this organic expansion of my thought realm by way of connecting to thousands of readers all across the globe. I am keen to see whether my thoughts are able to find a resonance in the worlds which I have never been exposed to. Below is a brief description of the book for you to take a buy call. “I wish to die, now”, is an individual’s tryst with himself; a passionate attempt to set the self free – a self that is holed in conventions, a self that is trapped in conditions and a self that is bound by compulsions. The author uses the medium of words to let the trapped energy of within, manifest itself. These are not mere essays or articles; these are the reflections of a sensitive soul, which is craving to break out. The reader will encounter a variety of thoughts that will make him/her get closer to his/her deeper persona. From belief systems to communal behavior, from entrepreneurship to gratefulness, from politics to friendship, from philosophical prose to romantic poetry, from essays to opinions – it is a really broad canvas, which is a potent space for an exploratory reader to dwell in. As Nietzsche puts it, “one must have chaos inside oneself to give birth to a dancing star”; the passages in the book will take the reader closer to the chaos that exists within him/her. It will make you question, it will make you wonder, and it will shake away all your inertia and bring you closer to your true being. Irrespective of your interest in the specifics of subject matter, the book will connect you to the thoughts presented. The book will give a fillip to your sense of exploration and wonder. And all of these come out as scintillating word sketches from a first time author, who describes himself as an expressionist. “I wish to die, now” will make you want to live, even more! here’s the link to the amazon page. If you happen to buy the book, I request you to take time out to give your review on the amazon page. That shall really help me to know how my thoughts are being perceived. you have published a book !